Service learning happens at Eagleridge! Eagleridge students soar to new heights! Registration for the Fall 2019 semester begins Thursday, April 25, 2019 at 9:00pm for students currently enrolled at Eagleridge. Students new to Eagleridge may register on Monday, May 6, 2019. You can now see class descriptions on our website. Vision: Be the leader in providing innovative enrichment opportunities and support for all homeschool students. Create an environment that supports the academic and social/emotional needs of ALL students. Promote open communication between home and school. Develop engaging lessons that promote 21st Century skills. Work as a team to collaborate and support one another. Encourage and challenge students to reach their highest potential. Primary/Intermediate students arrive at 7:50 a.m. and classes begin at 8 a.m.
All students arrive at 8:20 a.m. and classes begin at 8:30 a.m.
Primary dismissal at 2 p.m. Dismissal for all students at 3:25 p.m. Proudly serving the educational needs of the valley's homeschool community since 1996. Eagleridge is a homeschooling enrichment program where students soar to new academic and social heights! 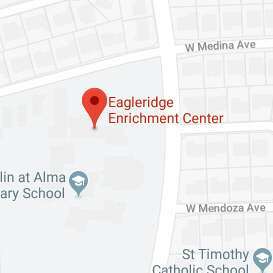 Eagleridge Enrichment Program delivers unique, individualized enrichment opportunities for students that are homeschooled throughout the Valley. We offer a wide selection of schedules and classes to choose from. Our state certified instructors provide a wide variety of very interesting, engaging and enriching classes focused on creativity, cooperative learning, and exploration. We also provide parents with homeschool materials and resources free of charge.